Get ready for a flavor explosion in your mouth! This pesto pasta is beyond good. It is phenomenal. Lick the bowl, not one morsel left, phenomenal. I actually think it is better than traditional pestos that use nuts. Most pestos use pine nuts as a main ingredient and some use walnuts. We always avoid buying products with pesto or ordering pesto at restaurants, etc. With that said, cooking in my own home is a different story! I love making things from scratch. I especially enjoy making "safe" versions of recipes that call for nuts or that may contain. I want my girl to try curry, pad thai, mole and pesto- all of the dishes we normally stay far, far away from. In the safety of our own home, I show ingredients to our girl, talk about recipes and dishes, let her get messy and most importantly of all, I try to educate her. I talk to her about cooking safe at home and about how she can enjoy any dish she wants by substituting and/or omitting ingredients here or there. Instead of using nuts in this recipe, I use Go Raw's Sprouted Pumpkin Seeds. I love them and use them all the time in recipes that call for nuts. They are a fantastic substitution in just about any recipe! I also use italian parsley in this recipe. There are many different types of pesto - basil, parsley, even cilantro pesto. I personally love parsley the best but you can really sub whatever herb you like for this recipe. One last little note. I never actually measure when I make pesto. I stand by the food processor with a spoon and make it to taste. So don't be mad, but these measurements are just general guesses. I know those of you who like to be exact are not very happy with me right now (because I used to be the same way when I first started cooking), but please don't stray. Stay with me and trust me on this - the measurements don't have to be exact. Make this one to taste! *You can keep this recipe dairy free by not including the cheese. I typically don't include cheese but you can if you'd like! Prep the parsley by removing the leaves from stems, washing them and setting them out on paper towels to dry. You don't want to add too much water to the pesto so it's important to blot the parsley dry with paper towels first. Toss the olive oil, Go Raw Sprouted Pumpkin Seeds, garlic, parsley, a pinch of salt and a pinch of black pepper into a food processor and blend. You can eyeball how smooth it is, but I usually stop after a few seconds, scrape down any ingredients from the sides that didn't get mixed in and then blend a few more seconds. Taste. Do you need more salt? Is it too thick (add a little more olive oil)? Is it bland (add more parsley and salt to pep up the flavor)? Is it "nutty" enough (you can add more pumpkin seeds)? Go with your taste buds! You can also make this as smooth as you want. It is best to pulse the food processor at the end to get the perfect texture for your taste. Steam your broccoli. No need to add flavor here. Let the pesto do the work. I like to sauté the tomatoes in just a splash of olive oil before tossing them in so that they are hot and pop with flavor when you bite into them. Boil the pasta in salted water. Drain. 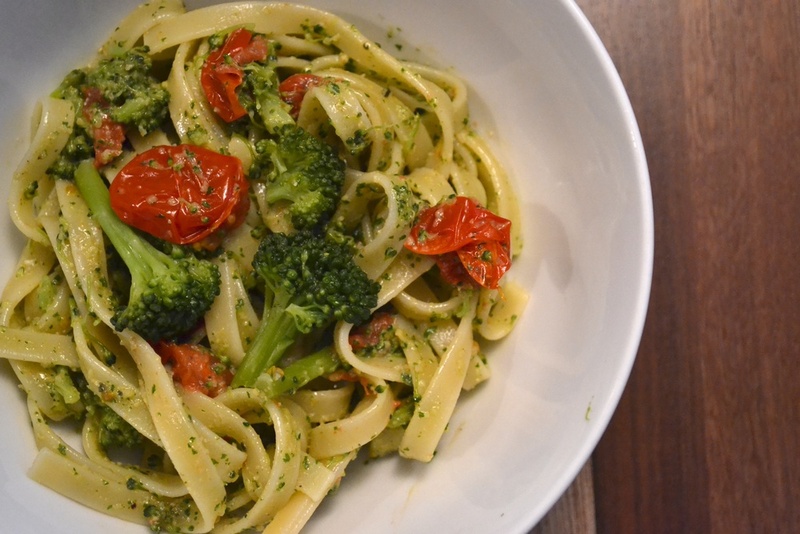 Toss the pasta, broccoli, tomatoes, and pesto in a large bowl. Serve family style and enjoy! Posted on April 29, 2014 by Kristen Rutter and filed under Recipes and tagged #foodallergies #foodallergy #nutfree #peanutfree #pesto #pasta #dinner. Don't let the title of this post fool you. This bread is amazing. 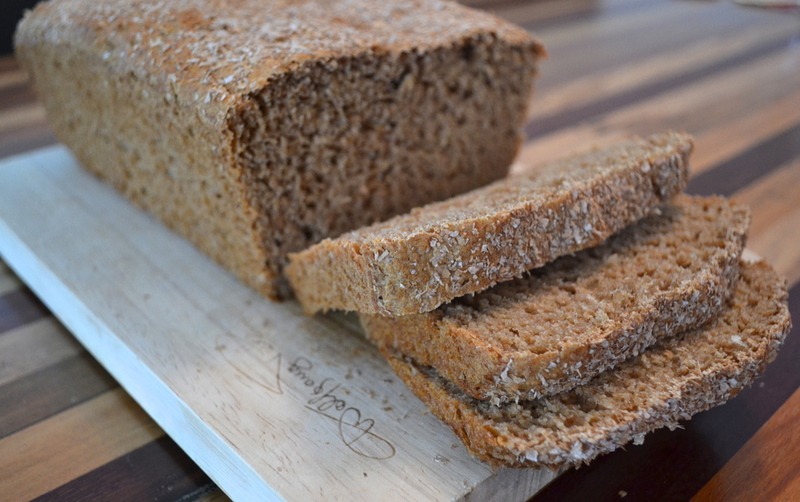 It is far from "plain Jane" sandwich bread. Every loaf I make turns out just as good as the last. It is not only predictable, it is delicious. This bread is my comfort. I feel great making it and I feel great eating it. It's the kind of bread that the kiddos want to watch bake in the oven because they can't wait to have a warm slice when it's all done. Slightly adapted from the Vegan No Knead Whole Wheat Sandwich Bread recipe found on veganbaking.net. Whisk together maple syrup, warm water and dry active yeast. Let stand for at least 10 minutes to let yeast activate. While waiting, whisk together flour, bran and salt. Add the wet ingredients to the dry ingredients and mix well. Cover with plastic wrap and let rise for an hour and a half in a warm place. I use my empty oven. After this first rise, stir the dough for 30 seconds, cover again and let rise again for another hour and a half. After this second rise, stir again for another 30 seconds. Prepare your pan by lightly oiling it. Gently form the dough into the pan and cover it. Allow to rise at room temperature for about 40 minutes. Uncover and let rest for another 10 minutes. If the dough starts to spill over the edges, you can take it and stretch it over itself to the opposite side, working your way around the perimeter of the loaf. Dust the top of the loaf with wheat bran. Bake for about 45 minutes, rotating half way through to ensure even baking. The internal temperature of the bread should read 180-190 degrees. 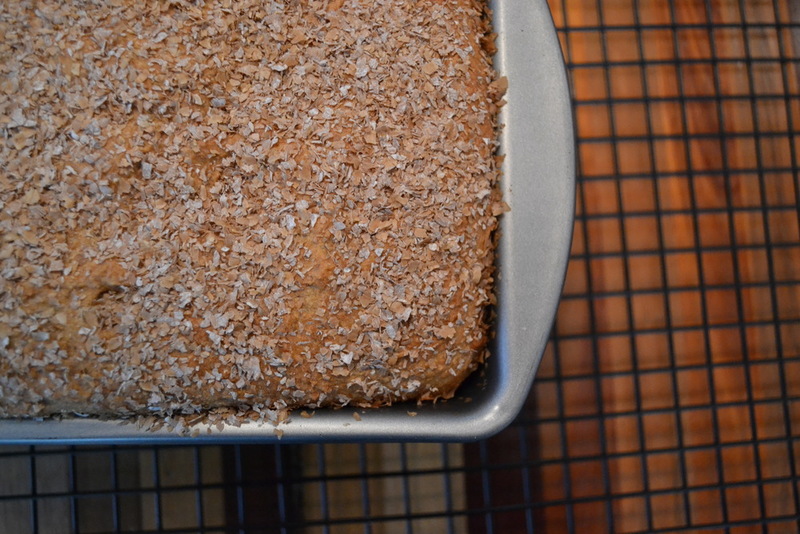 Leave bread in loaf pan for about 30 minutes before removing and allowing to cool completely on a wire rack. Pre-slice and freeze or keep in the refrigerator. Serve toasted with your favorite buttery spread and jelly! Enjoy! Posted on March 22, 2014 by Kristen Rutter and filed under Recipes and tagged baking bread vegan dairyfree eggfree nutfree peanutfree soyfree. Get ready people! These are so good and so easy to make. A quick disclaimer before we start: ***These are NOT free of the top 8 common allergens as they do contain SOY. That said, they are peanut, tree nut, fish, shellfish, egg, milk, wheat and gluten free! I love Asian food and crave it often. Our days of getting take out ended when our daughter was diagnosed with her peanut and tree nut allergies. The only Asian food my daughter has ever tasted has been homemade, from scratch and within the protective walls of our home, so that I have complete control over what is in the dish. Whenever I get the urge to order in, I make these little bad boys instead and make the whole house happy. Makes as many rolls as you want! You can really use any veggies you have on hand. I also like including bell pepper but didn't have any around today. Slice those fresh veggies right up! Next, make the dipping sauce. I use one tablespoon (or two if I am feeding more people or want leftovers) of SunButter and then add in soy sauce while whisking constantly to mix it up well. You want it to be the consistency of a dipping sauce. I usually just eyeball it and taste test until I get the right combo of SunButter and soy. You really can't go wrong. Just remember that a little of the dipping sauce goes a LONG way. It is very flavorful. You can also add some red pepper flakes if you like a little heat. Making the rolls is really simple. Too simple! You have to soak the rice paper in warm water to soften it up. Fill the bottom of a pie dish, flan pan or round cake pan with warm water. You don't need much. Just enough to completely submerge one rice paper under water. You only have to keep it submerged for about one minute for it to soften up. You can't really mess up with timing here either. It is pretty fool proof. If you need to leave it in longer to make it softer and more pliable, go for it. Take the rice paper out and lay flat on a plate. Start laying the stuffing out on one side. Then tightly roll to the opposite side, folding the ends of the paper over as you roll so they are tucked in. Easy as 1-2-3! Serve with your SunButter dipping sauce and enjoy! 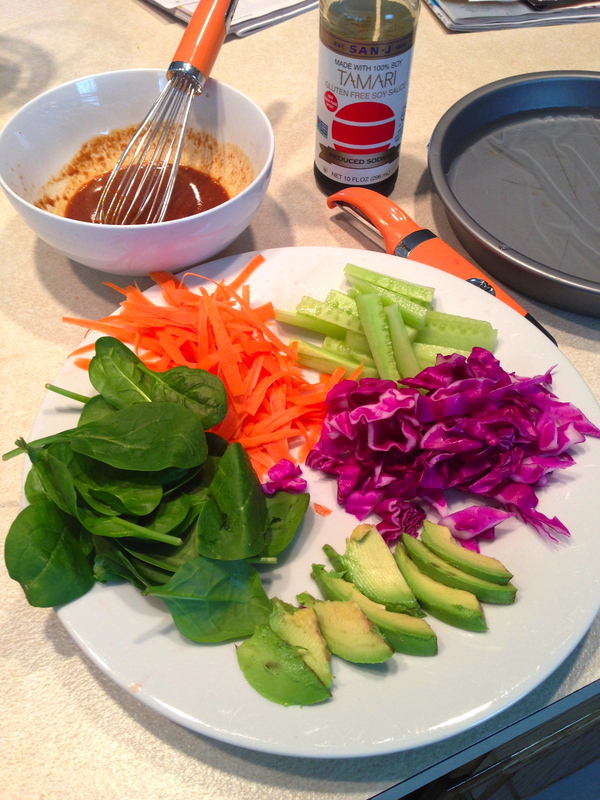 Sometimes I have dipping sauce leftover and we eat it with fresh sliced veggies for a snack until its all gone! This is a simple and safe Asian dish that everyone will love. Healthy, nutritious and delicious! Posted on January 1, 2014 by Kristen Rutter and filed under Recipes.